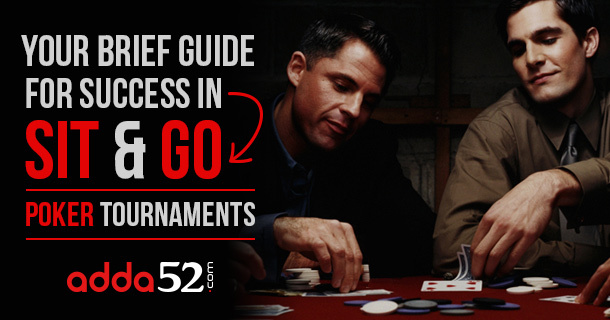 In the early rounds of a Sit & Go poker tournament, it is important to play tightly. Make sure you fold all weak hands but play all big hands strongly. Yes, if you happen to pick up something big like A-A, K-K, Q-Q, A-K, A-Q, and so forth, then you should not make the mistake of making small raises pre-flop. Always play such hands correctly by raising 3-4 times the big blind. Remember, if you want to narrow the field, don’t make your bets so small that people with weak hands will call or chase you. Make full use of your best hands, forcing your opponents to fold and ultimately getting their chips. Keep in mind, the top pairs don’t always mean the raises. If you don’t hit the flop with such hands, it is okay to let them go, because you haven’t invested too much money in the pot and hence you still have a good chance to get out of the hand. Novice poker players often don’t play connectors in the early rounds of the SNGs, which is not a good idea. Since the blinds are very small in the early rounds, you should play suited connectors and suited gap connectors, especially when you are in position, because you are likely to hit a straight or flush. Another reason why you should play connectors is that it costs you only small parentage of your stacks if you don’t hit a pair, straight or flush on the board. Always play your hands with high potential and fold the weak ones to increase your winning chances. In the middle rounds of the SNG online poker tournaments, the blinds go up and hence the players require to change their pace of the game. At this stage, playing suited connectors or weak hands is very risky and can knock you out of the tournament. It is actually a time when you should change your game a bit and play only strong hands and big pairs like 7-7 or bigger to move ahead in the game. Keep in mind, if your chip stack is well above the average, you should wait for the premium hands. But if your stack is below the average, you will have to play some hands to build up your stack and come back in the game. You will require to move in with 10-10- or higher hands like A-K and A-Q at this stage. These are strong hands and will be able to build stacks for you. When you play aggressively with such hands, your opponent is likely to fold and give away his/her stacks without having you to show down the hand. The only hands you won’t want to be up against at this stage may be J-J and A-A. Always, be a strong observer at the table and identify fishes and bluffers. Once you identify them, plan a strategy for both fishers and bluffers to get their chips and finally knock them out of the game. This is the stage of the game when blinds are usually very high and players with below average stacks are at higher risk. As a Sit and Go Poker Tournament player, always be careful playing against the big stacked players, as they can easily bust you out. Don’t go against big stacks unless you have a big hand to beat them. As soon as you enter last phase of the game, you should always aim to win in the game. It’s okay to take some risk and move in with ace or pocket pair pre-flop, because the blinds are so high. Take some risks and make bluffs, because well-times bluffs at this stage are necessary to win. The last phase of the SNG poker tournaments is a time when you want to take down as many pots as possible by going all-in before the flop with premium hands. At this stage, something like A-8 may be the best hand to move all-in especially when you are 3 handed, but it may be hard to play because you flop an Ace 18% of the time. If you have something good, play a bit aggressively, as you often get a caller with weaker hands like KQ , KJ, and other small holdings to amass your stacks to move up. India’s largest poker site Adda52.com offers SNG tourneys suitable for all bankrolls. Poker payers can take part in a variety of tournaments starting at just Rs.11 to Rs. 5100 and expect to win big money in on the poker site. To register and play Sit & Go tournaments, check out Adda52.com game lobby now!